A long but comfortable drive to Ponsanooth Cornwall. 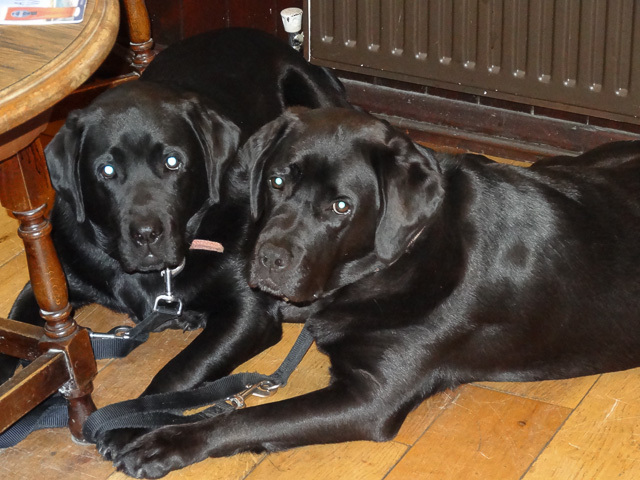 After settling into our home for the week Mum & Dad make us go to the local pub! Well boys – you obviously have a hard life!! Having to go on all these holidays, stay in lovely cottages with nice warm fires, go for long walks through fields and along beaches with all the interesting new friends, sights, smells [and tastes!!] – and then you have to go to the pub and be made a fuss of. Who would have a dog’s life eh?? But strangely you both look like you love it!!! As usual, probably my mistake, but I’ve posted comments previously and all went well, but I realized mine from Sunday did not “go anywhere”. All the photos were lovely, oh to have “coats like theirs, exuding good health”.